Waste not, want ... what? The challenge of material and waste management is rising. The U.S. EPA estimates that the nation’s waste output has tripled since the 1960s. But communities are caught in a swirl of competing needs and goals: infrastructure, environment, economics, equity, public health, and technology. When they all flow together, they raise more questions than answers. Planning for Sustainable Material and Waste Management meets the challenge in a way planners can put to work now and for the long term. This timely PAS Report draws from studies and practices undertaken across the United States and beyond. Out of their lessons come six concrete planning ideas developed by coauthors Ning Ai, PhD, and Nancey Green Leigh, PhD, FAICP. Break down the silos of land, air, and water regulations, they advise. Integrate infrastructure. Look at comprehensive costs. See what green jobs can do for a struggling labor force. Watch for undue impacts on disadvantaged areas. Keep deep data to show the value that better MWM brings. Together, these six ideas can help local governments pull away from end-of-pipe waste management. In its place, planners can push toward material-centered systems and closed-loop programs. Waste products can turn into new products — and new opportunities. Much can be done to advance sustainable MWM goals. 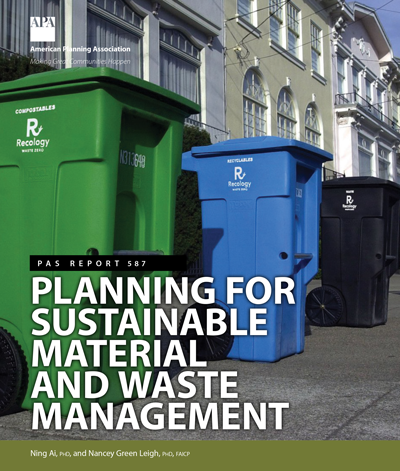 Planning for Sustainable Material and Waste Management gives planners the tools to act across agencies, with smart technologies and stakeholder support. The stakes are high, and the time is now. It’s an opportunity no one can afford to waste. Ning Ai, PhD, is an assistant professor in the Department of Urban Planning and Policy at the University of Illinois at Chicago, with a joint appointment at the Institute for Environmental Science and Policy. Her research focuses on urban environmental planning, material and waste management, and system analysis of urban sustainability. Ai also chairs the Resource Conservation Technical Coordinating Committee of the Air & Waste Management Association. Nancey Green Leigh, PhD, FAICP, is a professor of city and regional planning at the Georgia Institute of Technology and associate dean for research in its College of Design. Leigh has published five books, including Planning Local Economic Development, 6th edition, as well as resources for planning practitioners. Her research focuses on sustainable economic development. Overview of Municipal Solid Waste in the U.S.